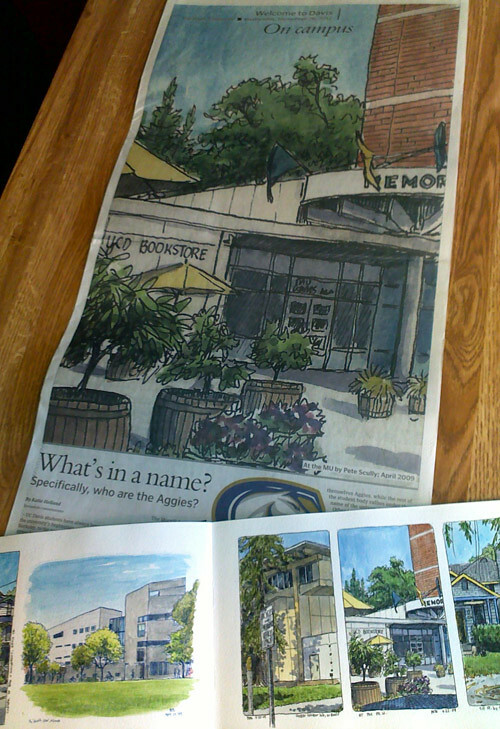 I didn’t post the rest of the Davis Enterprise’s “Welcome to Davis” editions from a couple of weeks back, so here they are. These are big!! Broadsheets, really. Plus they make good curtains as you can see. 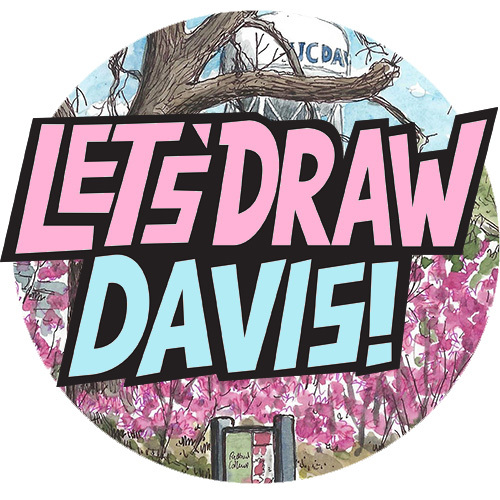 I’m pretty chuffed to have had this honour, and hope that the people of Davis enjoyed them. Now the Toad Hollow sketch from the ‘Only in Davis’ edition, as I mentioned previously, is pretty small – a few inches up and across. 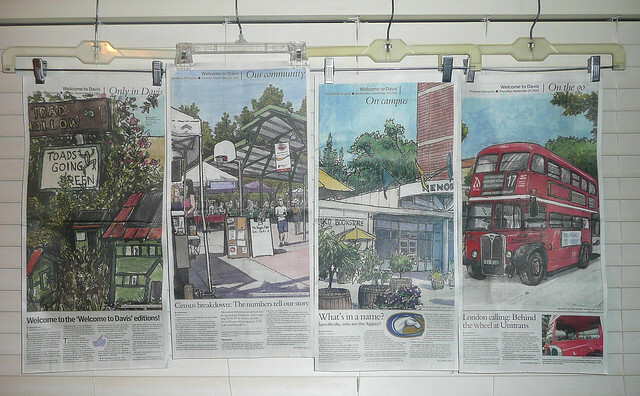 I though you might be interested to see the other originals set against the papers themselves. 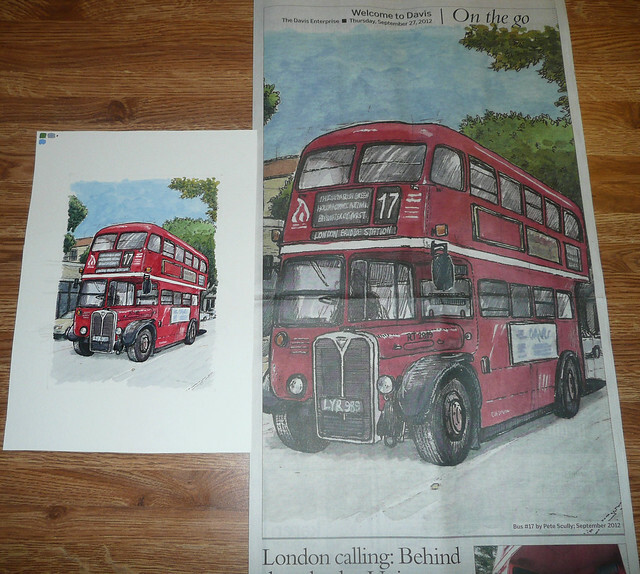 For the ‘On the Go’ edition my drawing of one of the Unitrans London double-deckers was used, so here’s a size comparison – the original was about 7″x5″ or so, and in fact if you’re in Davis and want to see it (or buy it) it’s at the Pence Gallery on D Street right now. 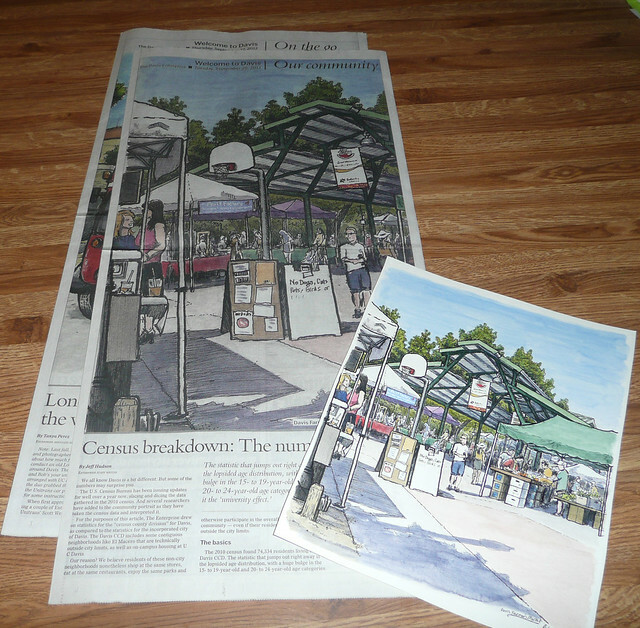 For the ‘Our Community’ edition my recent drawing of the Farmer’s Market was used. Incidentally, the sign in the middle has only some of the writing on it because they started packing up when I got to drawing that bit and I missed the rest. I did think ahead though and took a photo beforehand, very smart, but there was a lot of glare so I never could read it all. Doesn’t matter. The fellow standing next to it, he has a passing resemblance to me, because the passer-by that I actually drew was actually wearing a Tottenham t-shirt and stopped to talk for a moment when I said ‘Come on you Spurs!’ So in honour, I actually made this person look like me, though he really didn’t. Most moving people in these in-public-place drawings look generic anyway, as it’s always hard to really capture someone while they’re walking past, though otherwise all of the people that ended up in this one were actually the people stood there. Anyway, I loved how this turned out in the paper, and if that’s you in the drawing, hello there. And finally, the really small one, which actually translated pretty well large, I thought. I sketched that one lunchtime at the Memorial Union back in 2009, and it took up a third of a page of my Moleskine. So anyway there you are. Many thanks to Tanya Perez at the Davis Enterprise, who does a great job in the Welcome editions, and it was great to be a part if them this time.